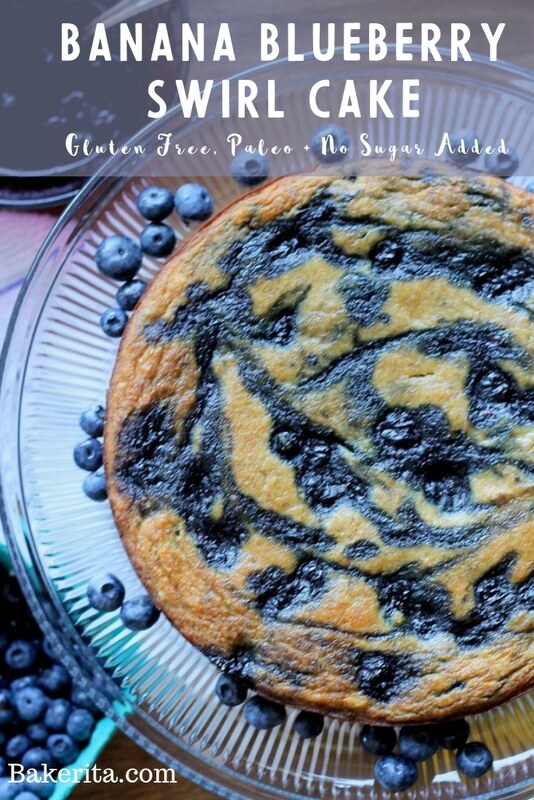 This Paleo Banana Blueberry Swirl Cake has a blueberry compote swirled throughout, for a moist and tender cake that’s also gluten-free and Paleo! 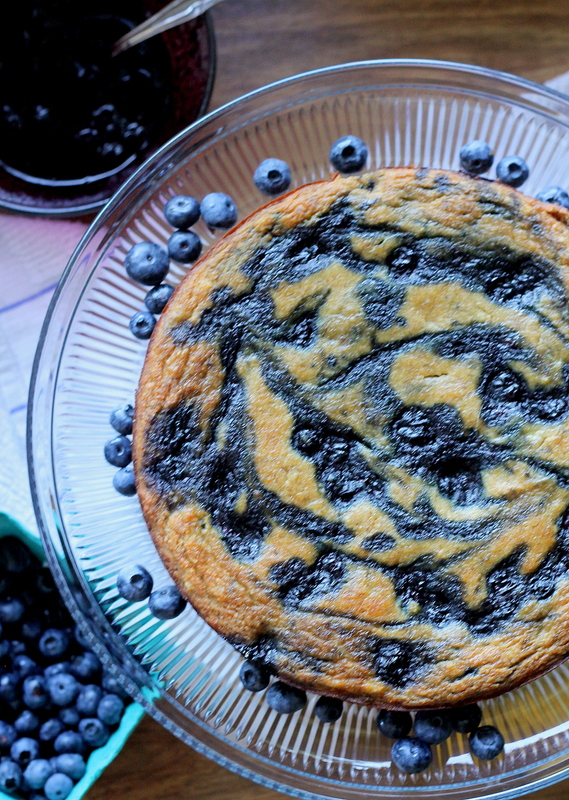 This easy recipe is healthy enough to enjoy for breakfast. Is it a bread? Is it a cake? This recipe is sort of an odd in between, but I called it a cake because it looked more like a cake than a bread. But it’s totally a cake you can eat for breakfast, zero guilt involved. Awesome, huh? 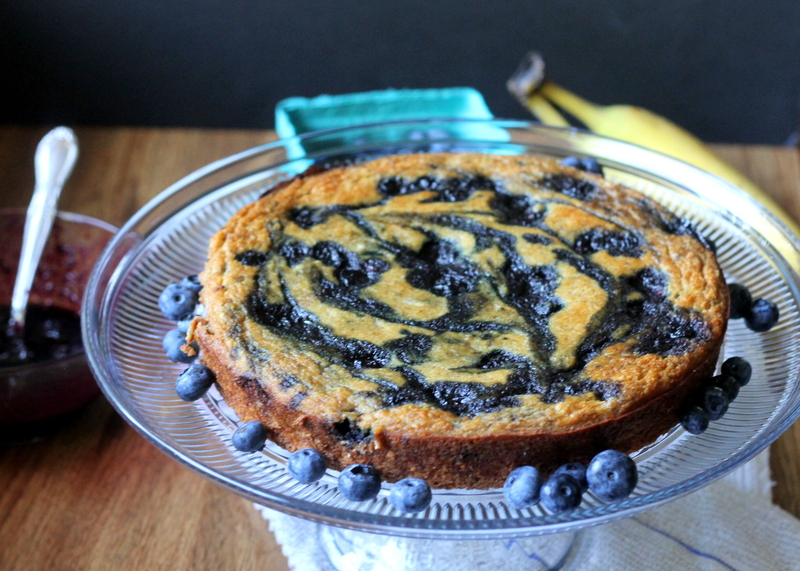 This cake is barely sweetened at all, but lacks no sweetness thanks to the bananas and blueberries. It’s also incredibly moist and tender. It’s totally Paleo, gluten-free, grain-free, and dairy-free. It’s also beautiful! Look at those swirls! Oh – and the compote!! It’s seriously so easy to make. Three ingredients: fresh blueberries, water, honey. You could sub maple syrup for the honey if that’s more convenient/to keep the compote vegan. You bring the ingredients to a boil, then turn it to a simmer and leave it alone for about 10 minutes, stirring once in a while. Then let it cool. That’s that. It takes a few minutes, and the result is a luscious, sweet, amazingly easy compote. You could 100% slather this on toast, over ice cream, in your oatmeal, in a smoothie…skies the limit. But FIRST – put it in this cake. 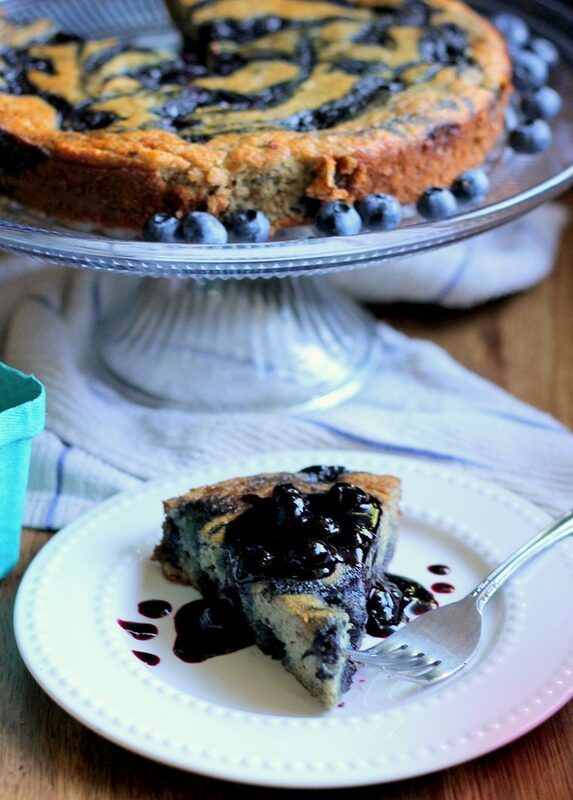 This cake is such a perfect way to satisfy a sweet tooth without any guilt. I absolutely love the versatility that bananas provide, and how they add sweetness and moisture and all things that make cakes and breads even better. So much goodness in one little fruit! 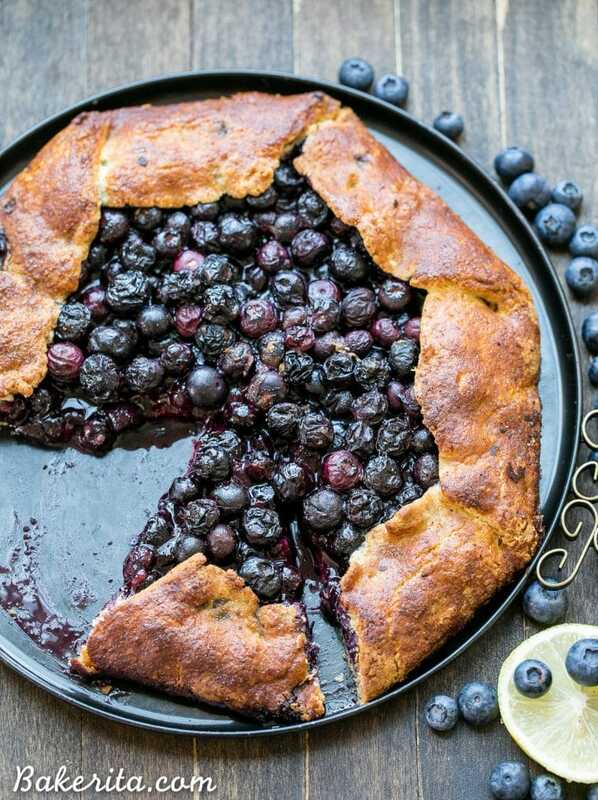 I’m obsessed with that blueberry compote (SO easy!) and how wonderfully it swirled into the batter. It baked up so beautifully and left such pretty blue swirls throughout the cake. Also: the swirls make the cake naturally look pretty which saves you the trouble of having to gussy it up if you want to impress! I ate slivers of this cake, morning and night while it was around (it wasn’t long…). It stayed so good the whole time it lasted, and it tasted even better slathered with a little bit of my Dark Chocolate Coconut Almond Butter (already went through two batches of that stuff!). You guys have to try this one before summer ends and blueberries become exorbitantly expensive again – for real. And remember: cakes are for breakfast, especially this one. Make compote first (recipe below). Let cool while you make the cake batter. Preheat the oven to 350ºF. Grease an 8" or 9" round baking pan with coconut oil. Stir in the almond flour, coconut flour, tapioca flour, salt, and baking soda. Spread half of the batter onto the bottom of the prepared pan. Dollop cooled compote on the batter, and swirl it in slightly with a knife. Cover with remaining batter and repeat with compote. Combine all ingredients in a saucepan. Bring water to a boil, and then set to simmer for about 10-15 minutes, stirring occasionally, until blueberries start to break down and the mixture thickens. When this happens, remove from heat and place in the refrigerator to cool while you prepare the cake batter. Keep any extra compote refrigerated and serve with cake! This looks so so good, Rachel. Want now! I think I must of died and went to heaven because these look absolutely fabulous!!! I am such a banana fan. In fact if you stop over at my blog I just did a banana post. Anyways, this might be going on my bucket list to make!!!! 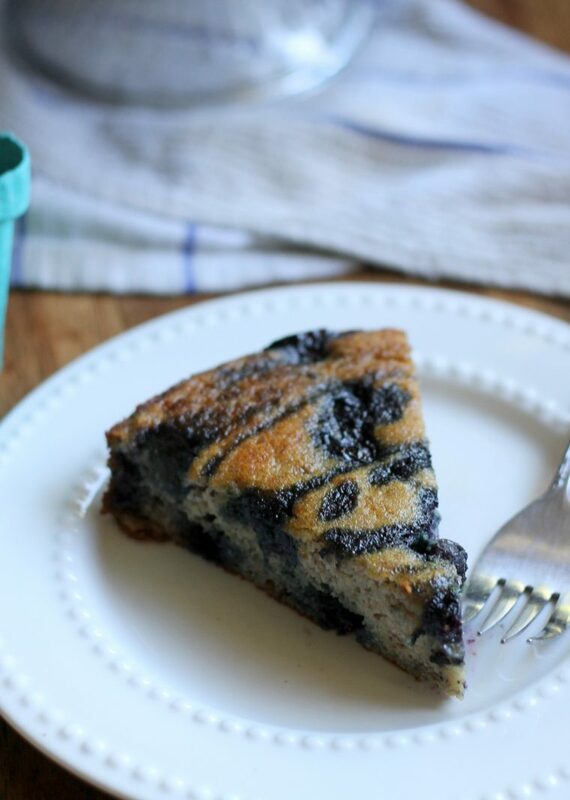 I’m seriously so impressed with all your paleo baking! You go girl! Bread, cake, heaven…. whatever you call it, I’ve just decided that it needs to make an appereance into my life AS SOON AS POSSIBLE! Cake for breakfast?! Yes please! .. Looks absolutely delicious!! Love it!! Yum. A guilt free cake that I can eat for breakfast without public ridicule!! Oh Rachel that looks amazing! I love the shade and that compote is to die for! When i tell you this looks amazing. Um. This looks AMAZING!!! What a compliment! So glad your little ones loved this cake :) thanks for letting me know you loved it Sophie! Any sub for the coconut and tapioca flour? I know it’s supposed to be gluten free and paleo, but could I use regular flour for the whole amount of flours? 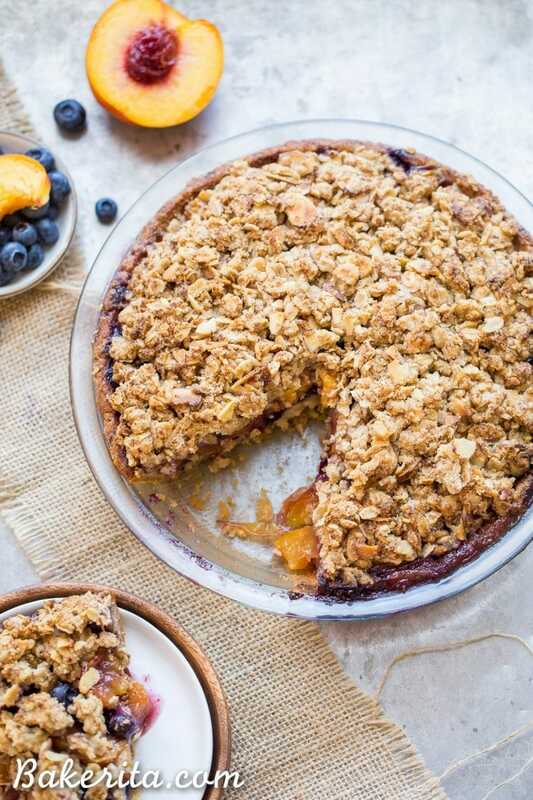 I’m trying not to buy anything new this week but this looks so good… Also, I can’t have coconut, and it’s hard to figure out what to sub in for coconut flour and oil. Thanks! Hi Karen, I’m not sure how to sub the coconut flour since it has very unique properties. You could try using more almond flour, but I can guarantee how it will turn out. Try looking up coconut flour substitutions! Cornstarch can be subbed for the tapioca flour though. For the coconut oil, butter or any other oil should do the trick. Let me know how it goes! Haha – YES!!! Definitely :) It’s so easy and delicious…you’ll love it! Hi- Just wanted to say thanks so much for some fresh Paleo recipes! I’m a baker at heart, and your recipes are making it easy to convert the family. Thanks again, and please keep the Paleo options coming! Will be adding your site to my list of go tos! Will egg whites work instead of eggs? Thanks! Hi Jessica. I haven’t tried just egg whites, but it would probably work out. There might be a slight difference in texture because of the lack of fat from the egg yolks, but it shouldn’t be too noticeable. Make sure to use 2 egg whites for each egg. I’d love to hear how it tirns out!! Thanks for this awesome recipe! Can’t wait to try it this weekend! I don’t have any of the flours listed (only all-purpose and whole wheat). Is it okay if I just substitute it with the ones I have? Hi Clara. The flours used in this recipe have different properties than traditional wheat flours and the liquid to flour ratio would need to be adjusted. Unfortunately, I haven’t tried this recipe using wheat flour so I’m not sure what the correct measurements would be. You could find the right flour substitution ratios online though! Good luck. 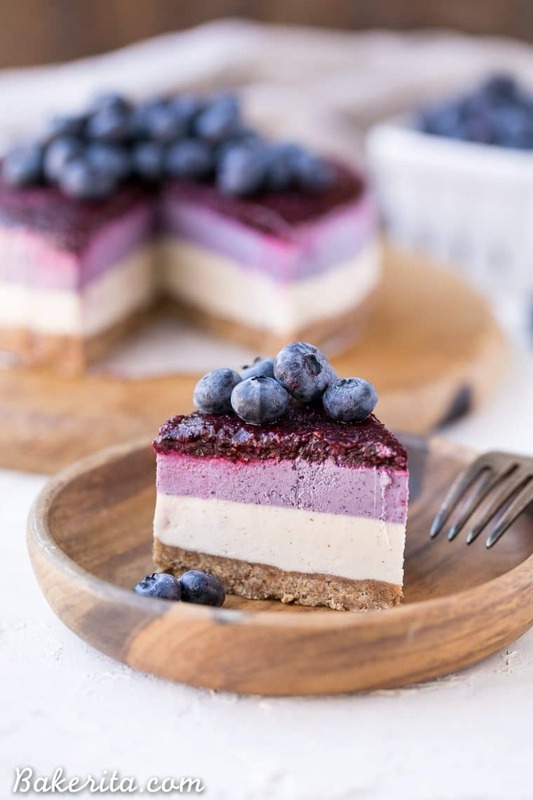 This looks great and I’m hoping to make it for my girlfriend this week, however she can’t have store bought almond milk, or any milk for that matter…and I’m not quite ready to start making my own…so any thoughts on how it would go if I left it out? I know it’s a good amount of liquid so perhaps I need to bump up another ingredient? Hi David, what is it about store bought almond milk she can’t have? There’s a brand called New Barn available at Whole Foods that doesn’t have all the additives that most almond milks have. You do have to have some kind of liquid or the cake will be too dry. Coconut milk could be used in it’s place if she can have that. Let me know if you have any other questions! Thanks for the reply Rachel. I’m not exactly sure but I think her system processes it better if it’s made fresh. We managed to get some today from a Juice Press and they make theirs it in-house. I will be trying it out tomorrow. Thanks again! Wonderful, hope you both love it! I made it and it was so good. Perfect amount of sweets and I love the compote.